To make the Pork Lo Mein, I had to buy a whole pork tenderloin. I only needed part of it, so I decided to put it in the crock pot and make some pulled pork. The only problem was that I hadn’t planned for that, so I didn’t really have the ingredients that were in a lot of the recipes. So I improvised with the ingredients that I had, and it came out great! And as luck would have it, I had a bunch of fresh rolls that were perfect for it. It’s pretty simple, really. Just place the tenderloin in the crock pot, pour all of the ingredients on top, and let it cook until it pulls apart with a fork. In my case, about 5 hours. To serve, put some of the shredded pork on the bottom half of a roll. 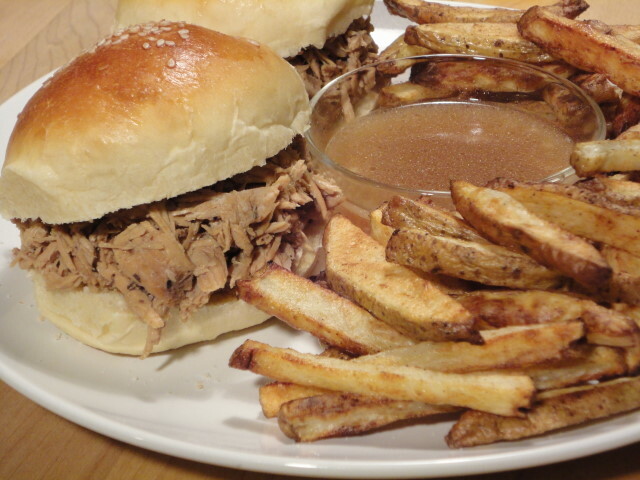 I dip the bottom of the top half of the roll into the au jus–the sauce that is made from cooking the tenderloin. Eating pulled pork on a fresh roll…it doesn’t get much better than that! Did you make those fries?? They look great too.